Each year, VPR collaborates with the Vermont Humanities Council’s statewide reading program, Vermont Reads. This year, the council is making two books available in recognition of the Sesquicentennial of the American Civil War. They are Paul Fleischman’s Bull Run, a novel published in 1993, and The Red Badge of Courage by Stephen Crane, a classic tale of the Civil War first published in 1895. While Bull Run looks at the Civil War from multiple points of view, Red Badge delves deeply into one man’s reaction to war itself. Together, they invite us to examine and discuss the social context of war, the expectations, the aftermath, and the experience of battle itself. In Bull Run author Paul Fleischman paints a picture of one group of young men departing for war. "Women cut buttons off their clothes and handed them through the windows as keepsakes. The church society gave the men Bibles, each inscribed with "Fight the good fight." Girls whose beaus hadn’t joined shamed them by giving out flowers to soldiers. The cars moved, drawing taut and then snapping dozens of parting conversations. "Stain your sword to the hilt!" shouted the waving woman beside me. Susannah, my eldest, scurried after the train. She’d supplied her husband with razor, mirror, hairbrush, nail file, calfskin slippers, and a fine suit of clothes to be saved for his triumphant entry into Washington. "Do try not to soil the coat!" she called out." Bull Run marked the first major battle of the Civil War, a time before the full horror of the conflict was understood. Paul Fleischman says he told the story in the first person from the point of view of sixteen different characters, eight northerners and eight southerners – male, female, black, white, old, young, soldier, and civilian. "Bull Run was my attempt to go symphonic. So 16 voices are kind of similar to a full orchestra compliment and working out who would appear where and what material would be said by whom was very much like fitting together a symphony," Fleischman said. Writing from the different characters in their perspectives, especially the southern ones, might elicit sympathy for the southern cause in some readers, but Fleischman says that wasn’t a concern. "I’m trying to present everybody’s point of view. That’s what writers do. We see all of our cast from the inside, you try to see what they see in their position. And in the southern point of view, the north was oppressing them." But is there a bottom line lesson that needs to be conveyed that at least the motivations behind the war for the south were to maintain a way of life that was inherently evil in that it was dependent on slavery? "The theme of this book was more the quick voyage from innocence to experience that the country went to, during that one day. Because before that you had just the bands blaring and the rhetoric flying. And after that you had men groaning, and hospital wagons being pulled over rocky ground, and death and you had burying horses and you had all the aftermath of a battle. So that was really my concern a broader, general, view of war seen through this particular battle rather than the slavery cause," Flesichman said. As Bull Run began, people didn’t really understand what the Civil War was going to become. People were taking picnic baskets out to go and look at this battle as if it were going to be an easy not very difficult thing and it turned out to be just the opposite of that. Fleischman said history tends to repeat itself. "And history never goes out of date. Literature never goes out of date, because human nature doesn’t change very much. Look at shock and awe, you know, that was the video version of those picnics on the hill. Instead of an outdoor picnic it was an indoor television event. It was seen as entertainment. And in deed, just as with the Bull Run spectators, we had no idea what would follow, and how hard it would be and how long it would take, and how much death would follow." Vermonters fought at Bull Run, although their fame wouldn’t come until later in the war. But even before this first battle, Vermont was an early and enthusiastic supporter of the Union cause. The Civil War in Vermont began at the State House in 1861, when the governor called for a special session to get support for the war. 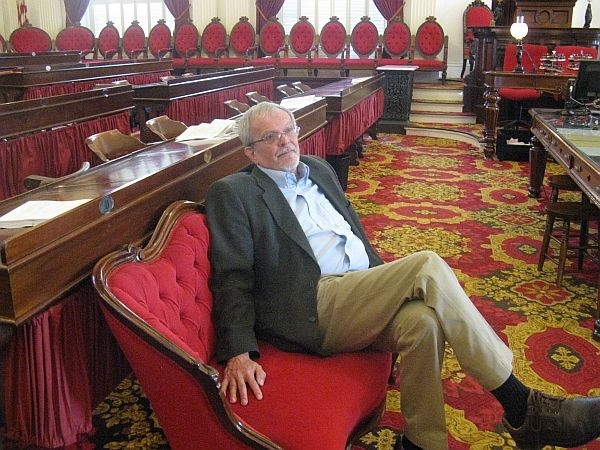 On the floor of the House of Representatives, Civil War Historian and author Howard Coffin says the room still looks very much like it did that day. Howard says they gathered, "in extra section as they called it then, summoned by Governor Erastus Fairbanks, to deal with the beginning Civil War. And the legislature voted a million dollars to start the war effort." That special session was re-enacted at the Statehouse last spring, with Lt. Governor Phil Scott standing in for Governor Fairbanks. "In this patriotic enthusiasm, Vermont eminently participates. Her citizens, always loyal to the union will in this hour of peril, will rally for the protection of the government and the constitution," Scott read. But were Vermonters motivated more by the preservation of the Union, or the abolition of slavery? 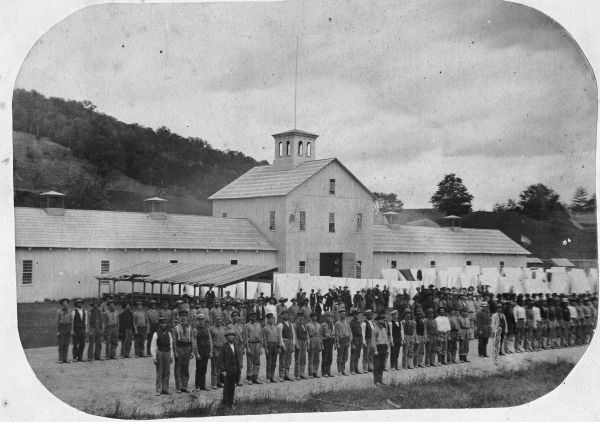 Howard Coffin says the anti-slavery movement had a strong hold in Vermont, "but when the Civil War began, the call for men, the war meetings that were held, the enthusiastic response to the governor’s call for men was to defend the union that’s why they went off to war." There was enthusiasm in the House of Representatives, among those Vermont farm boys who fought, who gave their lives, who went and did what had to be done, which is juxtaposed against the outcome of this war. The Civil War was the deadliest in American history. Estimates of the number of people on both sides was recently updated from about 600,000, which is about the population of the state of Vermont to upwards of 700,000, maybe even 750,000. Howard Coffin says the incredibly bloody nature of the war changed dramatically during the Civil War. "When the war began, the bands were playing, war rallies were held in every town, speeches were given, flags were flying, you know, and the boys came down from the farms and enlisted in droves. And then the first winter of the war, the caskets started coming home, the boys who had died from sickness. Vermonters died like flies when they got into the union camps. They didn’t have any immunity, they came from pristine Vermont. And then the fighting begins and the dead and the wounded begin to come home, especially in 1864. When new quotas came from the federal government, which were translated into quotas for each town to fill, it became increasingly difficult for those towns to meet the quotas," Coffin said. But Coffin says this tiny state, was essential in being part of what was the ultimate success of the union army and the freedom of millions of people. "We sent 34,238 men to war. The official records say that 5,224 died, I think the number who died was about 6,000. Erastus Fairbanks, governor of Vermont said, we believe, in a telegram to Lincoln as the war was beginning said, "Vermont will do its full duty." A lovely terse little sentence that summed it up. And I think that Vermont did," Coffin said. Our series, Vermont Reads, Bull Run and Red Badge of Courage continues all this week. Tomorrow we’ll take a look at life and leadership in a time of war. Today we conclude our 2012 collaboration with the Vermont Humanities Council’s statewide reading program, Vermont Reads. This morning, we take a look at the legacy of the Civil War, and the impact of war in general on Vermont and the nation. As part of VPR’s weeklong series, Vermont Reads Bull Run, we look at how war is written about in literature, and what we can learn about the experience and the truths of war by reading about it.